There are two types of dialysis hemodialysis and peritoneal dialysis. In peritoneal dialysis the cleansing of blood along with removal of extra fluids is done by body’s natural filter, the peritoneal membrane. The abdominal cavity comprising spleen, stomach, liver and intestines are surrounded by lining called peritoneal membrane. Globally, higher prevalence of End Stage Renal Disease (ESRD), growing population of patients with acute diabetes and elevated blood pressure, rise in the awareness among people regarding peritoneal dialysis, increasing government initiative across the globe, growing demand for technologically advanced treatment procedure are the prime growth drivers of global peritoneal dialysis market. In addition, increase in adoption of peritoneal dialysis in emerging economies such as China, India and others, will create new opportunities for global peritoneal dialysis market. However, higher risk of infection and failure, permanent catheter placement outside the body, and complex policies for the approval of new dialysis products are the key restraints for global peritoneal dialysis market. Geographically North America dominated global peritoneal dialysis market because of higher population of patients with chronic disorders such as diabetes and hypertension, high medical reimbursement facilities, and technological advancement. Asia Pacific is projected to have fastest growth, owing to rapidly increasing aging population, rise in consumer awareness, favourable government policies, modernization of healthcare infrastructure, and growing medical tourism industry in developing nations such as China, and India in this region. Among all the applications, Continuous Ambulatory Peritoneal Dialysis (CAPD) has the highest market share in global peritoneal dialysis market due to rising awareness and demand for machine less invasive treatment. Currently, peritoneal dialyzer is the market leader among all type of peritoneal dialysis. This report identifies the global peritoneal dialysis market size in for the year 2014-2016, and forecast of the same for year 2021. 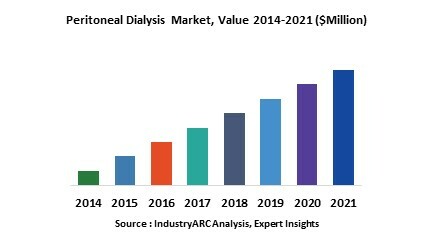 It also highlights the market drivers, restraints, growth indicators, challenges, and other key aspects with respect to global peritoneal dialysis market.